Lightning Struck Me FOUR Times! One thing that I adore about all of you is your generous spirits! Whether you are putting clip-art into your blogs for us to use, or putting in instructions for some fun crafty project, sharing your vacation memories and fueling our vacation dreams, or hosting a give-away. You reveal bits and pieces of your lives, and if that isn't enough, and you give of yourselves in so many ways! Well, this past ten days I have been the lucky recipient of FOUR blog give-aways! Four generous and talented women gave away some fabulous things, and I posted a comment to each of their blogs. The random-number-generator fairies were smiling at me as my comment number was selected four different times! One of my favorite blogs is the delightful Shabby Fu Fu run by the wonderful Janet! Her eye for the most delightful shabby cottage and vintage French finds is unmatched! Do yourself a favor and take a look at the offerings on her website! Talk about EYE CANDY! Wow!~~To celebrate her 100th post, Janet gave away the most awesome corona made of brass and rhinestones with a perfectly vintage patina! I about passed out when my number was drawn for this stunning beauty! The fabulous Brenda over at her lovely blog has posted pics of where some of the creative ladies in blogland create! I just love seeing other's studio and creative spaces, don't you? At her sweet request I sent her a few pictures of my studio. I posted an entry about my creative space over a year ago, but I thought you might like a little update. Here is my desk and chair. As you can see the walls of my office/studio are my favorie shade of green. My space is in the basement of our home. The hallway leading to my office is lined with shelves stacked to the rafters with fabric! I am actually sitting in this chair right now! You can alco see the corner of my comfy chair which is used mostly by the cat or my son. This is the inspiration board that sits to my left. It is jam packed with lots of fun stuff! I just can't bring myself to edit this fabulous chaos! This is the view from my desk chair. I have a Dwight SHrute bobblehead given to me by my hubby. The Office is our favorite show! I also have a Teddy Roosevelt bobblehead. Yes, you read that right. Teddy is from the Washington Nationals baseball team--he's one of four presidential mascots. And speaking of presidents, the gentleman on my TV screen is John Adams as played by Paul Giamatti. I am currrently obsessed with the John Adams series. I read the book and couldn't wait to get the DVD. Also there are a great deal of books on my shelves. I am a writer of historical romance (one book published) and I need research materials at my beck and call. The framed photos of the familiar, to some of you, men serve as "inspiration" for that aspect of my life. On the opposite side of the room from my desk is my sewing table. My dear grandmother owned this table and I am honored and inspired to inherit it from her. Also I have an autographed poster from The Proclaimers, one of my favorite bands, as well as a framed cover of my first book on the wall. Stacks of ribbon, baskets of fat quarters, cigar boxes full of buttons, and more and more stuff to use in my creation--it never ends, thank goodness! The "cakes" tin was a thrift store find, and it conceals my business cards and extra thread. In the stationery department I was immediatley attracted to the wonderful and too-sweet-for-words Sunny Patch school supplies. I grabbed these fun stickers! How could I resist the happy monkey on the cover????? 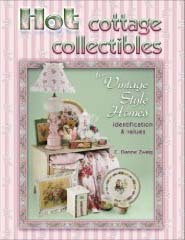 Back in February, Dianne Zweig, contacted me about a book she was working on, Hot Cottage Collectibles from Collector Books publishers. She had found my totes and pin cushions on line and thought they would work for a chapter entitled "Sew Cottag-y". I sent Dianne photos of my creations. This week I got a copy of the book and saw the fabulous results! If you adore the cottage style, this is the book for you! 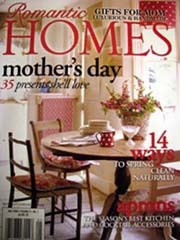 Lots and lots of photos from wonderful collectors, sellers, and crafters of cottage style are included in the over 300 pages--the layout is lovely! Here are the pages with my creations! I don't have these totes and pin cushions any longer, as they have been sold to folks all over the world. It is an honor to be in Diane's book! This birdhouse hankie tote in red, pink, and blue is one of my favorites! Lots of barkcloth totes! I've made a mountain of them! Diane did a section highlighting the hankie totes I make! I use vintage embroideries too! Love the pillows on the page! And Diane included some of my pin cushions too! In a week, our son will begin his first year of high school. Why do I so vividly remember taking him to his first day of pre-kindergarten, driving home, and then vacuuming the whole time he was there while worrying if he was having a good time? Now, he can walk or bike to school and wants to be so very independent as well he should be. But I am his mother and he is our one and only, so every new step he takes is a new step for us. The dime board is a fair highlight. You place a dime on a number. If the wheel hits your number you get a ticket for a drawing for the prizes up on the stage. The pick-up truck is for a different raffle! We won about 12 tickets, but our name wasn't drawn...sigh. This is the Roll 'Em game. It was invented about 50 years ago by a local doctor. It is harder than it looks. Our son tried three times but walked away without that furry pink boa constrictor. He had better luck at the duck pond. A winner every time! Even though he is older than most contestants, he still had a great time winning little animals and plastic trinkets. I could watch the ducks surf around that oval tank all day. Our son tried the pick up the bottle game, but knocked his bottle off of the platform after a few tries. Better luck next time. He did prove what a good shot he is by knocking down three "cats". In fact one shot knocked down two cats! He won an inflatable fish. ...And won a BIG stuffed dragon! The Paratropper ride was popular, but none of us wanted to be spun around after our rather big dinner before the fair. I like the pink cloud ride. Or is it a raspberry? You decide. I loved this pretzel painted on cardboard on the side of the, you guessed it, pretzel hut! Dragon under his arm, hubby encourages son to get a sno-cone...cherry or grape? They're both favorites and onlt fifty cents each! I have a storage problem, or should I say, I had a storage problem. I have way too many buttons. My initial storage solution was one of those plastic drawer thingys from the hardware store--you know the lots of little drawers that are supposed to hold nuts and bolts and nails? For quite a few years that worked well, but my button collection continued to grow even though I use lots of them in my crafting. I needed a better solution, but what? And I didn't want to spend a lot of money either. Then it dawned on me: cigar boxes. I have lots of them from my father, and I didn't have an immediate use for them so I had a nice little pile in the basement waiting for me to do something with them. I cut out magazine photos with colors that represented the buttons in each box and framed them with scalloped edge paper in the same colors. I stamped the color name on text from an old book and put that on top of the collage. The embellishment is only on one side of the box since they are stacked on a shelf. I have so much room for my buttons now. I divided some boxes down the middle to hold two colors that I usually don't have a lot of like orange and yellow. I do love my cheap--free!--storage solution! I now have room for--gasp!--more! I have been putting together a new grouping of pin cushions, and setting some aside for my etsy shop for the week of September 9th when I am one of 30 lucky etsy sellers who will be in a co-op ad in the October/November issue of Mary Engelbreit Home Companion magazine! 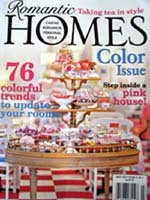 I want to have lots of goodies available for when the magazine launches. The result in my studio lately is a "hot mess" of half-made pin cushions.